A data visualisation tool has been developed to help IBD teams track performance against key performance indicators for biologics. The tool has been developed for the Registry by CIMS as an add-on to their InfoFlex IBD software and will be available initially for users of the IBD Registry Web Tool. (This development was funded by the final stage of the 2016/17 HQIP grant to the RCP for the IBD Audit.) 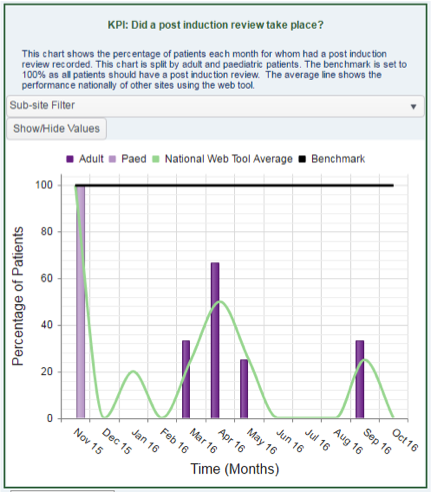 The charts show local data compared with the national standard and the average performance of all hospitals using the web tool. We hope the data visualisation tools will help teams identify how well they provide care against the key performance indicators and prompt them to make changes where necessary to improve the quality of patient care. The data visualisation tool will be launched in May and you can find out more at the IBD Registry Roadshow meetings and at the IBD Registry symposium at the BSG on 21st June. 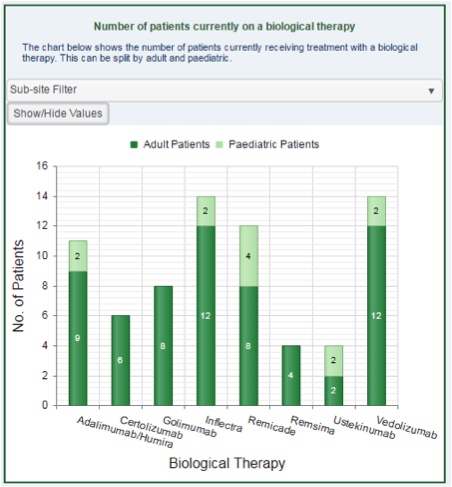 The charts below are samples showing number of patients receiving biological therapies and incidence of post-induction reviews (all data is fictional). The Registry is pleased to announce that grants to help teams with data entry have been made to the following Trusts: Birmingham Children’s, Brighton & Sussex, Coventry, Derby, East and North Herts, Northampton, Nottingham and West Herts. A second round of funding is now available: contact [email protected] for an application form. Applications need to be returned by 17th May 2017. Join us in Manchester on Wednesday 21st June at 4.30-6pm for the first presentation of the biologics KPIs, as well as the latest news on research projects using the Registry. Chaired by Stuart Bloom and Barney Hawthorne, speakers include David Barker, Fraser Cummings, Mark Allan, Keith Bodger and Angel Castro Silva. This online course starts on 8th May. The course focuses on clinical practice and processes, so will be most relevant to physicians, at all levels of training. However, anyone is welcome to participate, and there’s no charge to access the course. View the course here. If you’re coming to the BSG Annual Meeting in Liverpool next week, do come and say hello to us – we’re at stand B58 in the exhibition.